After undergoing a plumbing issue to your residence, it is important to call a team of plumbing professionals to come in and resolve your issue! That is where we come in! The Tri-County Plumbing Pros have the skill, expertise, and knowledge to fix your plumbing problem on the first trip! We know that plumbing disasters can happen on the weekend, on a holiday, or even during the night. That is why we are available for you 24 hours a day, 7 days a week, and 365 days a year for your convenience. 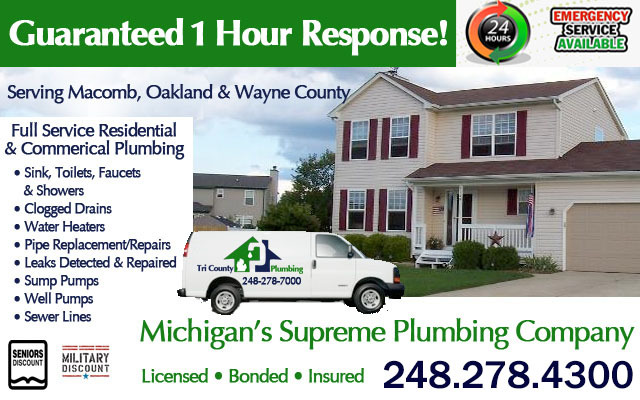 Because of our local offices all over Michigan, we can respond to your call quickly and in most cases, can arrive to your location within an hour of your call. Our staff is friendly and knowledgeable; they can also help you with any questions you may have before we arrive to your location. No job is too big or too small for the Tri-County Plumbing Pros to handle! We can handle anything from a leaky pipe on a small residence, to a plumbing installation on a commercial property. Our master plumbers will advise you over the phone of any immediate steps you need to take prior to their arrival. The first thing we will do when we arrive to your property is assess the damage, than give you a written estimate. Some plumbing companies may add in hidden fees that you won’t find out until the billing process, but we don’t do that! We are very upfront about our pricing and will not sneak in any hidden fees. Our experienced plumbers have the utmost respect for residents and their properties. When we do our walk through, we will use shoe covers and drop cloths as needed. We only employ the best of the best when it comes to equipment, because we only want to provide you with the best service. We are fully up to date on the most recent advances in the plumbing industry, and have the highest quality equipment available in the industry today. We are also fully licensed, bonded and insured. All of our skilled plumbers are fully knowledgeable about all local ordinances and building codes and permits needed. Here at Tri-County Plumbing Pros, we can tackle almost any type of plumbing problem you can throw at us! We have got you covered on anything relating to basins, back flow, basement problems, drains, excavations, leaks and leak detection, sewer, outdoor plumbing, pump installations, valve repairs, and anything pertaining to water and sewer maintenance. We can also provide services for clogged drains, sinks, showers, or toilet upgrades, and septic repairs and installations. The Tri-County Plumbing Pros offer a full range of plumbing services for your convenience. If you are having a plumbing problem, we are your solution! Customer satisfaction is our number one goal here at Tri-County Plumbing Pros, and we will do anything we can to achieve it! If that means working around the clock to ensure the job gets done right, than that is what we will do. We strive to provide our customers with excellent service that will leave them happy and comfortable when the job is done! We know that plumbing issues can be expected and cause a lot of stress, and that is why all of our technicians are compassionate and understanding of your situation. Call your local professionals at Tri-County Plumbing Pros today for any and all of your plumbing needs! We will get the job done in a safe and timely manner while still respecting your property and privacy. Suffering from water or flood damage in Oakland or Macomb County Michigan, contact Jarvis Property Restoration a local disaster recovery firm.